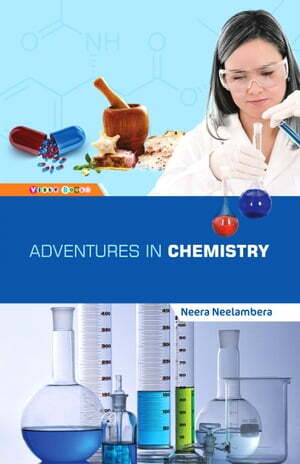 Collins Booksellers - Adventures in Chemistry by Neera Neelambera, 1230001488647. Buy this book online. Publisher: Vishv Books Private Ltd. There is more to chemistry than messy experiments in laboratories—doctors use it to fight diseases, chefs use it to cook food and farmers use it to increase the growth of their crops. Chemistry is all about different types of stuff—or substances, to use a scientific word. Chemistry study all kinds of substances—from everyday things, like mud and smoke, to rare, deadly ones like strong acids and explosive powders. Chemists are constantly asking questions and doing experiments to find the answers. ‘Adventures in Chemistry’ engages non-science majors in learning about compelling applications such as forensics, infectious diseases, and chemistry of art, while also introducing them to the fundamentals of chemistry through clear, concise language. The text presents core concepts and then shows how they apply to contemporary examples. With confidence in their understanding of basic pinciples, students can use their chemical knowledge to make well-informed decisions about the foods they eat, the medicines they take and the lifestyles they pursue. A throughly enjoyable book for one and all.